Pixar has had a reputation for making emotional films, with some of their works being famous for bringing audiences to tears. It shouldn’t be all too surprising then, that Pixar has decided to make a film about emotions themselves. 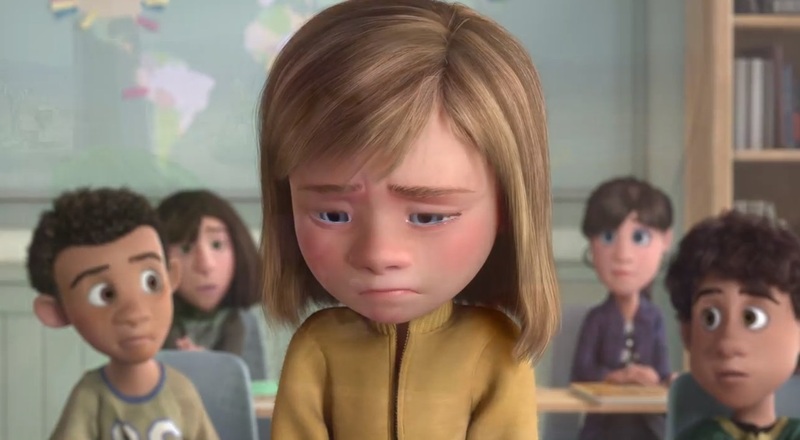 Inside Out tells the story of an eleven-year old girl named Riley. More accurately, it tells the story of the emotions that live inside her head: Joy, Sadness, Fear, Anger and Disgust. Joy, Riley’s first and most prominent emotion, is the leader of the bunch, and makes sure Riley’s core memories are happy ones. Sadness is there whenever Riley needs to shed some tears, but she has to be careful not to tamper with Riley’s emotional state too much. Fear is the voice of reason (and caution), as it’s his job to keep Riley safe. Anger is there to keep things on the defensive, and longs for the day when he can finally allow Riley to use a curse word. It’s Disgust’s job to influence Riley’s likes and dislikes. These emotions are, as they put it, what make Riley Riley. They use a control panel in the “headquarters” of Riley’s mind to shape her every day life and her memories. The most important of these memories in turn shape the “Islands of Personality” within Riley’s mind. Things are suddenly thrown into disarray, however, when Riley and her family move from their Minnesota home to San Francisco. Riley’s emotions don’t know how to handle the situation, and Sadness is compelled to tamper with Riley’s memories. Amidst all this chaos, Joy and Sadness accidentally get sent to the further reaches of Riley’s mind (including “Imagination Land” and “Long Term Memory” among others). Joy and Sadness must then work their way back to headquarters, as all five emotions are needed to keep Riley’s personality intact. If the premise sounds a bit weird, that’s because it is. 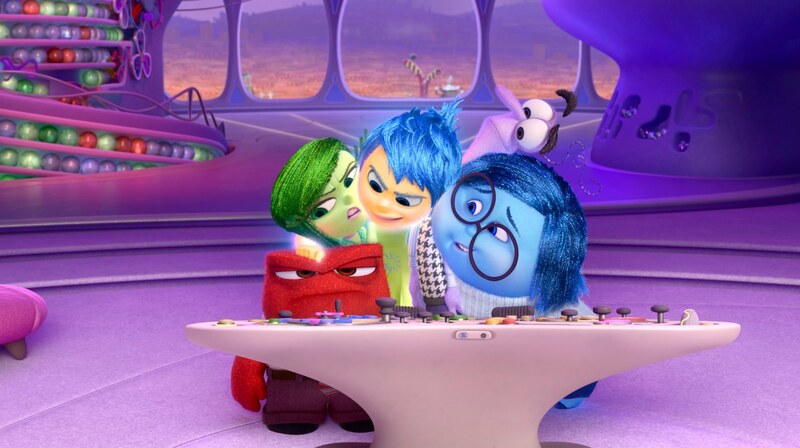 Inside Out is, quite beautifully, the weirdest movie Pixar has ever made. It’s also their most imaginative and their most visually unique, as its setup allows for its story to think outside the box like no Pixar movie has before. While the likes of Cars may feel creatively limited by their gimmick, and Brave was a missed opportunity to do something wondrous with its fantasy setting, Inside Out is constantly – and fittingly – coming up with new ideas that bring out the most of the concept’s humor and heart. Joy and Sadness befriend Riley’s long-forgotten imaginary friend, for example. He’s a part elephant, part cat, part dolphin made out of cotton candy who’s become something of a vagabond as Riley got older and left him behind. We also learn that Riley’s dreams are her mind’s equivalent of movies, and are put together by a film studio that regularly casts a unicorn in the lead role. We even get to see little peaks into the minds of Riley’s parents, leading to a series of gags of their own. Inside Out is a movie that’s always looking for new ways to delve deeper into its premise in the most creative ways possible. 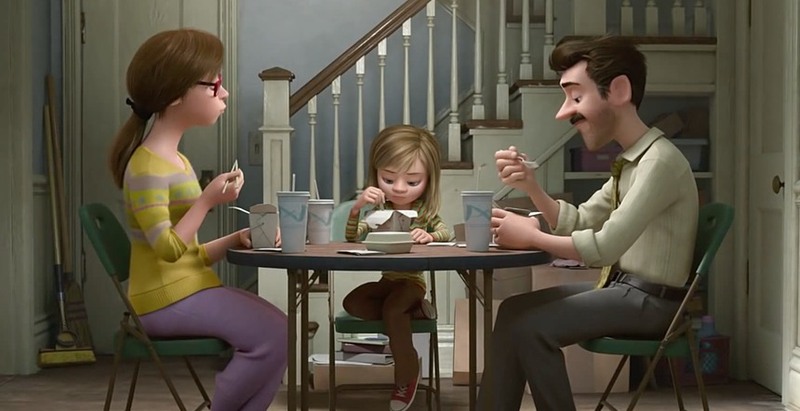 From simple gags to deeper storytelling elements, Inside Out never lets up with its imagination. It’s one of Pixar’s most ingenious concepts, and it’s used to its fullest. Some concepts work better than others, sure, but even its lesser ideas still boast more creative spirit than most movies. And you can’t fault Inside Out if some of its ideas don’t quite match up to others, considering it has so many great ideas going for it. Best of all is how deep and emotional the story ends up being. Inside Out deals with subjects like depression and the hardship of growing up in ways that you won’t find in most animated films aimed at children. It’s a surprisingly deep movie that really makes you care about the characters. As Riley struggles to adapt to her new life, you can’t help but feel for her. Both Riley’s story and the adventures of her emotions tie together beautifully. 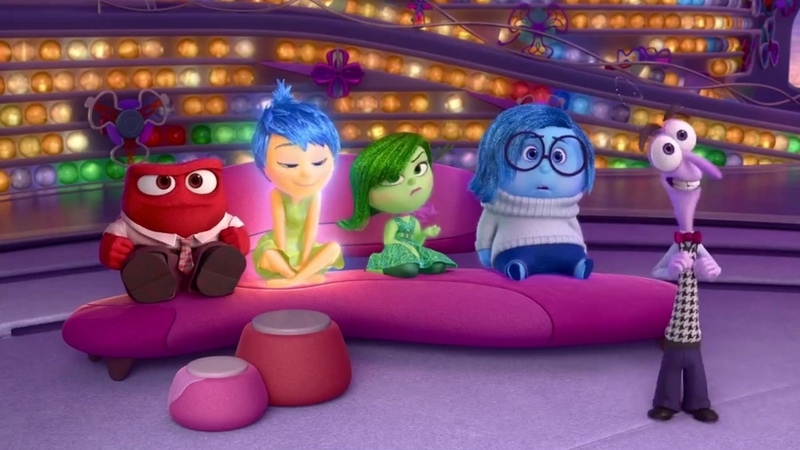 Inside Out is the most heartfelt movie Pixar has made in quite some time. I may sound a bit cynical for saying this, but even Up and Toy Story 3 could feel a bit mechanical at times. As good as they were, there were some moments in those films where the emotion felt a bit contrived. But with Inside Out, it would be difficult to imagine the sentiment could feel more earnest. The quality of Pixar’s films may have waned in recent years, with Cars 2 and Brave – the studio’s two weakest features – being released back-to-back, followed up with the good but ultimately unremarkable Monsters University. 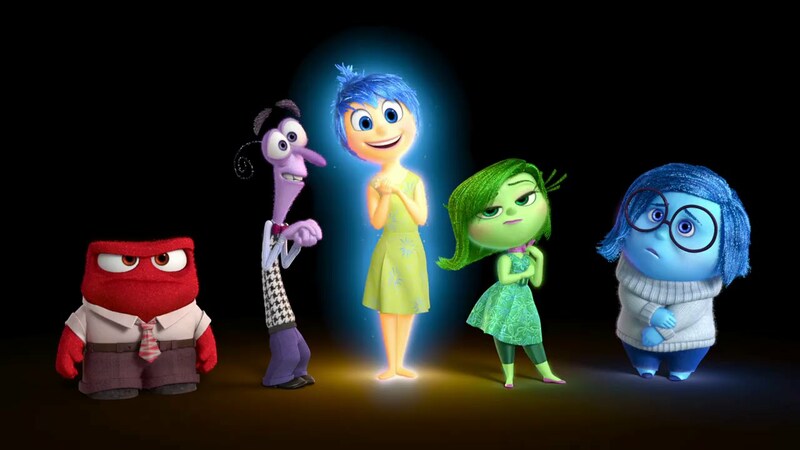 But Inside Out shares the spirit of Pixar’s greatest efforts of the past. This is the Pixar that made films like The Incredibles, Wall-E and Toy Story. Whether Inside Out is the beginning of a new Pixar streak or a one-time return to form, it deserves to be ranked favorably alongside any of the studio’s highlights. Inside Out is a wonderful film. It is a constantly inventive, emotional and visually arresting work that will – appropriately enough – etch its way into your memory. It’s an absolute joy. A wonderful review for a wonderful movie! The only bad thing about it is that it makes me frustrated the next movies coming through the Pixar pipeline (save for this year’s The Good Dinosaur) are all sequels…… oh, Disney, what are you doing with those amazing minds that Pixar houses. Thanks! Inside Out is as wonderful as Pixar gets! I’m not sure the sequels are Disney’s doing, since Pixar has creative control of what movies they’re working on. I suppose since John Lasseter and Ed Catmull are at the top of creative decisions for both companies it could be the case, but they were both originally Pixar guys. I’m actually looking very forward to The Incredibles 2, and skeptically excited for Finding Dory, but the other sequels are unnecessary. I hope The Good Dinosaur is, well, good. But I’m not expecting another Inside Out. We’ve seen dinosaurs and cavemen in animation before, so it doesn’t seem like anything new. Yeah, I am not that excited about The Good Dinosaur either. It seems too commonplace to be a stellar Pixar movie…. but who knows. And I have positive expectations for both Finding Dory and The Incredibles 2 (though I think the latter will be much more successful; you know, because…. Brad Bird!). I smell a Disney finger on the whole sequel debacle. There seems to be a push to turn everything into franchises. I think – and this is one huge assumption – Lasseter uses the endless credit he has among fans to shoulder the negative reactions Pixar had been getting. For example, he was the one who directed Cars 2, and – given his enormous talent – he had to know that thing was set to be a disaster. It is said the average development time for a Pixar flick is five years. Disney took over back in 2006, and 2011 eleven was precisely the year when all sequels started coming out: Cars 2 (2011), Monsters University (2013), and now the incoming avalanche that has the unjustifiable Toy Story 4 among its members. Not to mention all the production problems Good Dinosaur has been running into over the years. It sounds a bit too similar to what happened with Brave. I suppose it’s possible Disney has a hand with all of Pixar’s sequels, though I point out again that John Lasseter and Ed Catmull, who started at Pixar, are the ones in charge of a lot of this stuff. So maybe they’re just feeling overly nostalgic and want to bring back their beloved favorites? I’m clearly more optimistic about this scenario, even if I’m not overly optimistic about most of the sequels themselves (exceptions being Incredibles 2 and Disney’s Frozen 2, which have the potential for real greatness). I did not know about The Good Dinosaur’s production issues. I will read up on that. But yeah, it makes it sound like another Brave is in the making. At least if it turns out to be bad it will not be as disappointing as Merida’s adventure, because Brave had quite a huge potential due to its unique setting within the Pixar canon. I think Lasseter and Catmull have had a wonderful impact on the Walt Disney Animation Studio. It started pumping out an amazing stream of quality flicks – one you have written about – after both of them took over as overall creative leaders of both the house of mouse and Pixar. But I think that, inevitably, the upper direction – the freaking bean-counters and greedy shareholders – may end up pushing a few projects that the pair would not accept under normal circumstances. In those cases, they probably act as a filter between the creativity-shackling demands and the employees. That, of course, is all a crazy assumption that is solid in my mind because of some things I have witnessed when working in companies whose line of business has nothing to do with animation. But I assume the vices and infuriating decisions are sort of the same whenever you look.